The Missouri eviction notice forms are used to inform a tenant of their breach of a lease or that the rental term is up at the end of thirty days. In Missouri, if a tenant is late on rent, there is no notice requirement, but there has to be a written demand. The summons on a rent and possession lawsuit is considered sufficient written demand of the rent is over a month late, however, it makes sense to issue a Written Demand in order to potentially avoid having to proceed with a lawsuit. If tenant still refuses to pay after the written demand, landlord may Petition for Rent and Possession the Circuit Court for recovery of rent and possession. FAQ’s – Use the guide to Frequently Asked Questions about the eviction process in Missouri. Notice to Quit (Non-Payment) – Also known as a Written Demand, according to § 535.010, the landlord does not have to provide the tenant with notice that their rent is late, but there must be a Written Demand sent. The rent and possession lawsuit can constitute written demand as long as rent is at least a month late, but for a healthy landlord-tenant relationship, in addition to saving court costs to the landlord, it is recommended the landlord provide a written demand. 10-Day Notice to Quit (Non-Compliance) – This form is used when a tenant is breaching the terms of the lease other than by not paying rent. Tenant will have ten days to cure the breach or will have to vacate. 30-Day Notice to Quit (Month to Month) – This form is used to provide a party notice that they intend to end the month-to-month tenancy at the end of thirty days. Rent is due immediately on the date specified in the lease in Missouri. Written demand is required before a lawsuit can be filed. (A summons is sufficient if rent is more than a month late. Step 1 – First, a landlord must provide the proper notice to tenant of his or her intention to seek eviction if tenant does not comply. In Missouri, if rent is later, a Written Demand (Notice to Quit) is required before going to court, however, if rent is more than a month late, the service of process of a lawsuit is sufficient demand. 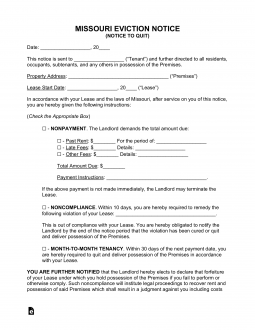 If there is a breach of some other term of the lease, other than for non-payment of rent, landlord may use this form: 10-Day Notice to Quit (Non-Compliance). If landlord or tenant is seeking to end a month-to-month tenancy, use this form: 30-Day Notice to Quit (Month to Month). Step 2 – If tenant fails to respond to landlord’s notices, landlord may proceed with a Petition for Rent and Possession in Circuit Court. The petition must be served on tenant either by a private process server, or the landlord can make a Motion for the court to serve the tenant. If the landlord seeks to remove tenant for other breach, he or she must file an unlawful detainer action. Step 3 – If the landlord prevails, the court will issue a judgment in favor of the landlord. Tenant will have ten days to appeal, after which the landlord may apply for a writ of possession. Each county has their own form. Here is an example of a Request for Writ of Possession from Lafayette county. The Missouri Property Agreement held by the Lessor and Lessee should be kept handy as some information from this document will be necessary to fill out the Notice to Quit form for this state. You may download this Notice using the PDF, ODT, or Word buttons visible by the document image on this page. The Name of the individual(s) this notice must focus upon must appear at the top of this page on the blank space below the title. The Missouri Property that concerns this document will need to be reported. The first statement should have the City, County, Zip Code, Building/Number, and any applicable Apartment Number filled into the appropriate areas in the first sentence. The Signature Date of the Lease Agreement must be cited in the second sentence on this page. Enter the Signature Date that binds the Landlord, Tenant, Rental Property, and Lease this Notice concerns itself in the appropriate areas in the second sentence. There will be a series of statements, each with a corresponding checkbox. Choose only one of these statements to solidify the subject matter of this Notice. The first checkbox, labeled “Nonpayment,” is geared to warn Tenants who are delinquent with their Rent Payments that they must pay the Agent you list on the first blank space (or the undersigned) the Amount of Money you list that must be paid for the Rental Period reported immediately or immediately yield possession of the Leased Property to the Landlord or Landlord Agent. Make sure to consult your records to enter this information accurately as you will need the Total Amount the Tenant owes and the Overdue Amount to be reported. The second checkbox, labeled “Noncompliance,” is geared to warn Tenants, not compliant with the Lease Terms, that a violation of Lease Terms has occurred and he or she has Ten Days to effect compliance or yield the possession of the Rented Property to the Landlord. Report the exact violation observed on the blank space. The fourth check box, also labeled “Month To Month Tenancy,” gives the Landlord Thirty Days’ Notice (at least) to the last day of an active Month to Month Lease. You must fill in this Date using the blank spaces provided. The Delivery Status will be defined by the Deliverer in the “Certificate of Service” section at the bottom of this document. This section requires the Deliverer to enter the Day, Month, and Year this document was delivered and the full Name of its Recipient. Then, he or she must mark one of the checkboxes below this statement. Each checkbox will refer to a status. The first refers to a successful hand delivery to the Addressee of this document. The second refers a hand delivery to a very reliable second party. The third will list Delivery as occurring through First Class Mail. The Deliverer must provide a Signature on the Signature Line.